One of the questions I get asked most by our small group leaders is how to explain our church’s belief in the doctrine of election (the biblical teaching that “before Creation God selected out of the human race, foreseen as fallen, those whom he would redeem, bring to faith, justify, and glorify in and through Jesus Christ“[ref] J.I. Packer, Concise Theology [/ref] ) and how that corresponds with our ability to make a real choice to become a Christ follower? It’s a great question, and one I like to explain by looking at the flow Romans 9-11. Wow! You’ve got to put on your big boy pants to the receive the kind of truth Paul’s dropping here. The picture painted is of a Being who has the prerogative of getting to call the shots in the who, what, and how his mercy is given…and is completely okay with doing so. Paul is saying, “Make no mistake, this is a part of who God is!” Now, I could go on but I think the point is well-founded that Romans 9 establishes the idea that God sovereignly elects individuals for salvation. How then will they call on him in whom they have not believed? And how are they to believe in him of whom they have never heard?And how are they to hear without someone preaching? And how are they to preach unless they are sent? As it is written, “How beautiful are the feet of those who preach the good news!” But they have not all obeyed the gospel. For Isaiah says, “Lord, who has believed what he has heard from us?” So faith comes from hearing, and hearing through the word of Christ. Wait a second? It sounds like Paul is saying that when it comes to salvation, every person has a responsibility to place their faith in Christ? That’s exactly what he is saying. Belief is our responsibility. The Big Question: Then Who? Once I outline these seemingly contrasting thoughts, the question always pops up: Okay Yancey, so when it comes to salvation, does God choose or do we choose? The answer is ‘Yes.’ My engineer-friends in my congregation don’t like this as much because it seems impossible, illogical, nonsensical. Yet, based on what the Bible says, this is exactly what’s at play. 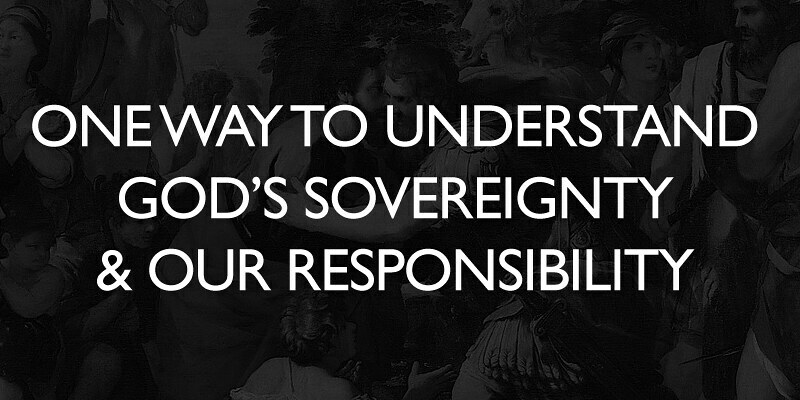 God is sovereign and we are responsible. He must choose and we must choose. When, invariably, the next question is “How can this be?” I simply reply, “I don’t know. It’s a mystery.” I do believe that from start to finish the Bible clearly teaches election AND it does the same with human responsibility. What it doesn’t clearly teach is how that all works out in the mind of God. But I’m okay with that. There’s a lot of truth about who God is or what he does that forces me to put it in the “mystery” category (e.g., Trinity, suffering, the Houston Astros). In fact, I’m more at peace with a God I can’t completely figure out. It kind of reinforces the fact he is God and I’m not. So mystery in the case of election isn’t a cop-out but one more reason I want to listen to God and not lecture him about why he does salvation the way the does. It is a mystery, and to look at Romans 11 is to see that’s what Paul was left with as well. Follow his train of thought. Mind you, this is one letter…even a complete, particular unit of thought in Romans 9-11. In other words, Paul isn’t being schizophrenic dropping in random and unrelated ideas; on the contrary, all of these truths about salvation are tied together. Paul clearly states salvation is by God’s sovereign election (Rom. 9) AND we are responsible to believe Jesus by faith (Rom. 10). Notice Paul’s conclusion to it all in: It’s a mystery! Oh, the depth of the riches and wisdom and knowledge of God! This is why at Clear Creek Community Church we offend people on both sides of the conversation. We upset those who say God doesn’t have any say in our salvation and we upset those who say we have no choice to make. We simply believe in both sides. We don’t hold these two truths in tension by mystery because it’s easier or a cop-out, but simply because we believe this is the revelation of our good and great God in his Word. God chooses, we have a choice, and mystery ties it all together. As you can see, I use Romans 9-11 as one way to understand God’s sovereignty and our responsibility in salvation. Is this a legitimate way to look at it? Obviously I think so. Are there better ways? Sure. Will everyone agree with my conclusions? Definitely not. Can this discussion provoke more questions than answers? Probably. But I don’t use this way of working through Romans 9-11 as a debate starter but simply to introduce to others how CCCC sees these truths and the tensions they bring. If you have other or better ways, more power to ya! When I saw what this post was about, I knew I had to make time to read it, and that’s saying a lot with our 6 week old Clara Kate! The subject of election has always been a tough one for me to accept. Your post gave me new understanding and perspective about it. Thanks so much for sharing! Thanks Laura! And congrats on Clara Kate. Thanks for your thoughts. I agree with them. -The Wycliffe Bible Commentary, NT Editor Everett F. Harrison, Moody; 1962.